Governors in the South-West Zone met on Monday in Abeokuta, the Ogun capital, and resolved to strengthen regional integration as pathway to the economic prosperity of the region. The governors agreed to work together to explore the different areas of comparative advantage of each constituent state and pool resources together for the prosperity of the people. Their decisions were contained in a communique issued after the one-day meeting. The leaders also resolved to develop a 25-year development master plan for the transformation of the entire region. They agreed to eliminate all artificial barriers that mitigate against co-operation, synergy and benefits of economies of scale within the region. The governors agreed to pay less attention to their political and religious affiliations and make the aggregate welfare of the Yoruba people their priorities. The forum, which resolved that it would henceforth be known and called ‘` Western Nigeria Governors’ Forum, ‘’ also declared the region a “zero tolerance area” for crime. They agreed to develop a revenue optimisation strategy for constituent states of the region, noting that the prosperity of any of the states would be negated if the other states were poor. The leaders agreed to set up a committee to codify the values and ethics of the Yoruba people as part of efforts to preserve the uniqueness of the people of the region. The host governor, Sen. Ibikunle Amosun, earlier in his opening remarks, noted that the forum serves as a platform to “cross-fertilise ” ideas for the good of the region. He called on the leaders to take advantage of the geographical location, climatic condition and the large land mass of the region to promote agriculture for food security in the region. Amosun also called for concerted efforts of the constituent states of the South-West region against crimes that threaten the peace of the area, including cultism, kidnapping and pipeline vandalism. 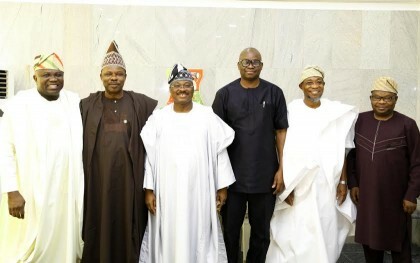 The meeting was attended by Governors Abiola Ajimobi‎ (Oyo), Rotimi Akeredolu (Ondo), Ayodele Fayose (Ekiti), Akinwunmi Ambode (Lagos), Rauf Aregbesola (Osun) and the host, Ibikunle Amosun (Ogun).